"Fun, it's in our Nature!" The Parks Division operates, maintains, constructs, and plans for park and recreational facilities, including developing new parks and administering open space areas. APRC manages 18 parks within the City limits, 797+ acres of parkland and 48 miles of trails. Lithia Park and North Mountain Park are just a few of the beautifully maintained parks within the City of Ashland. Be sure to check out our new Park and Trail Finder Web App! View info on the Lithia Park Master Plan (Public Meeting on Apr 25, 2019). "The Ashland Parks Foundation Receives Largest Gift to Date for Redesign of Japanese Garden in Lithia Park" . - Learn more! 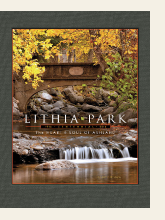 John Enders' book entitled, Lithia Park: The Heart & Soul of Ashland, is now available for purchase. What a wonderful gift for family and friends! The release of the book coincides with the 100-year Anniversary of the park in 2016 - (Cover photo courtesy Jeffrey McFarland) Learn more! Learn about our Adopt-a-Park Program!